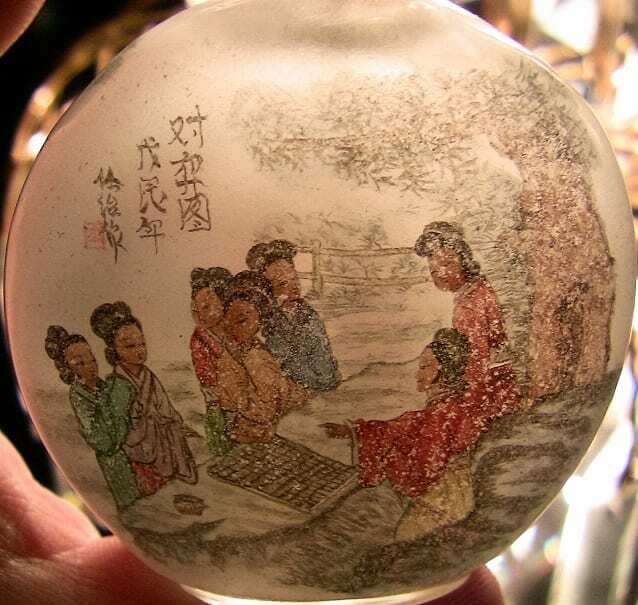 19C Chinese Signed Inside Painted Glass Snuff Bottle . 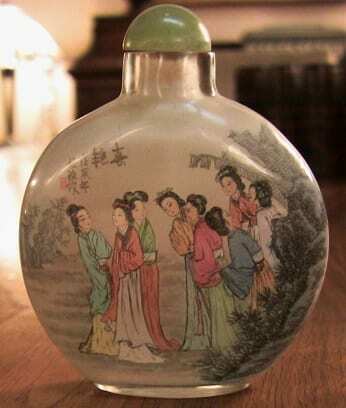 LOVELY 19th Century Chinese inside painted glass snuff bottle. Exceptional quality……signs of real age !!! We are of the opinion that it from circa 1850. Fully signed on front and back. Front features scene of ladies in national dress meeting in the garden and the other side depicts ladies in national dress playing board games indoors. The stopper is original….polished jadeite…..it still retains its original bone/faux ivory spoon in perfect condition. This is a QUALITY item !!! 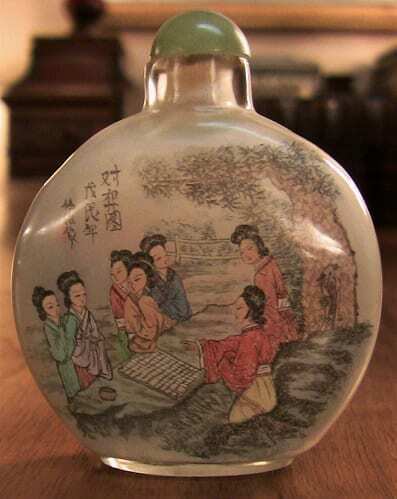 19C Chinese Signed Inside Painted Glass Snuff Bottle. SNUFF BOTTLES: Snuff bottles were used by the Chinese, Mongolians during the Qing Dynasty to contain powdered tobacco. 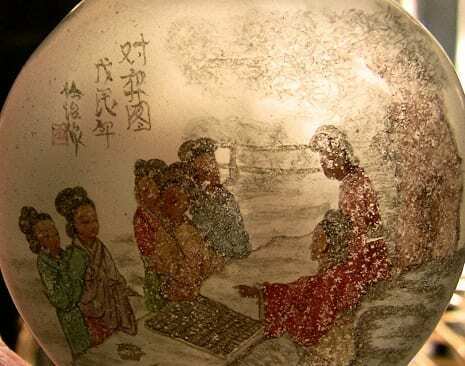 Smoking tobacco was illegal during the Qing Dynasty, but the use of snuff was allowed because the Chinese considered snuff to be a remedy for common illnesses such as colds, headaches and stomach disorders. Therefore, snuff was carried in a small bottle like other medicines. The snuff bottle replaced the snuff box used by Europeans. Tobacco was introduced by the Portuguese to the court at Beijing some time during the mid- to late-16th century. It was originally smoked in pipes before the establishment of the Qing Dynasty. The use of snuff and snuff bottles spread through the upper class, and by the end of the 17th century it had become a part of social ritual to use snuff. This lasted through most of the 18th century. Eventually, the trend spread into the rest of the country and into every social class. It was common to offer a pinch of snuff as a way to greet friends and relatives. Snuff bottles soon became an object of beauty and a way to represent status and wealth. The use of snuff increased and decreased with the rise and fall of the Qing Dynasty and died away soon after the establishment of the Republic of China. However, contemporary snuff bottles are still being made, and can be purchased in souvenir shops, flea markets and museum gift shops. 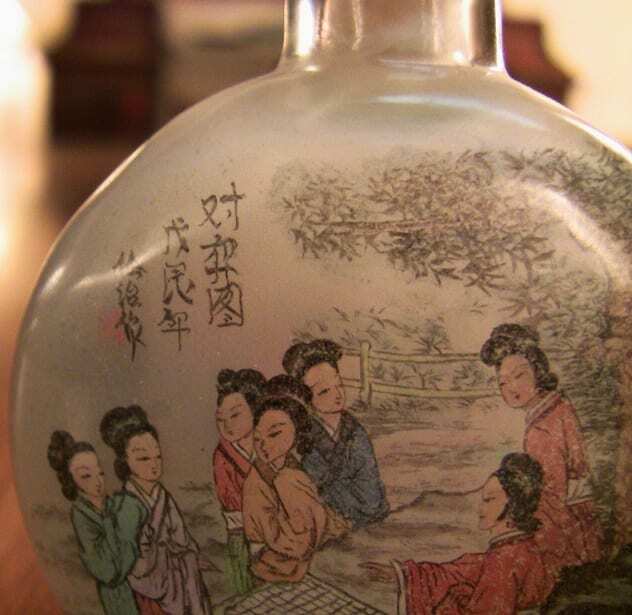 Original snuff bottles from the Qing period are a desirable target for serious collectors and museums. A good bottle has an extra quality over and above its exquisite beauty and value: that is touch. Snuff bottles were made to be held and so, as a rule, they have a pleasant tactile quality. The size of a snuff bottle is small enough to fit inside the palm. 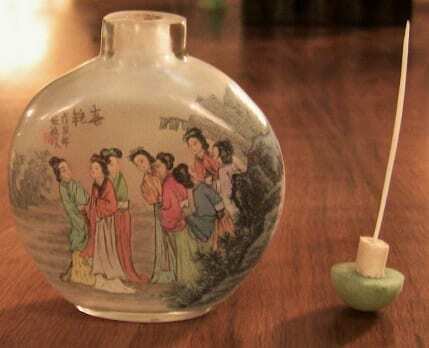 Snuff bottles were made out of many different materials including porcelain, jade, ivory, wood, tortoiseshell, metal and ceramic, though probably the most commonly used material was glass. The stopper usually had a very small spoon attached for extracting the snuff. Though rare, such bottles were also used by women in Europe in Victorian times, with the bottles typically made of cut glass. Without doubt, the class of bottle that arouses most interest in the non-collector is that known as inside painted. 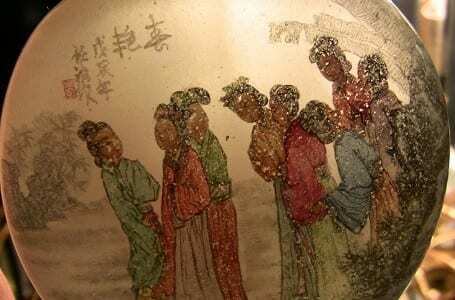 These are glass bottles which have pictures and often calligraphy painted on the inside surface of the glass. These delightful scenes are only an inch or two high and are painted while manipulating the brush through the neck of the bottle maybe only a quarter inch across, and also painted in reverse. Ursula Bourne, in her treatise on snuff, suggests that artisans painted on their backs to make it easier to work through the narrow opening. It has been said that a skilled artist may complete a simple bottle in a week while something special may take a month or more and that the best craftsmen will produce only a few bottles in a year. The earliest inside painted bottles are thought to have been made in the period between 1820 and 1830 as, by then, the beauty of a snuff bottle was probably more important than utilitarian considerations—-and considering this—few would have been used for holding snuff. Inside painted bottles are still made today—expensively for collectors and inexpensively as souvenirs. 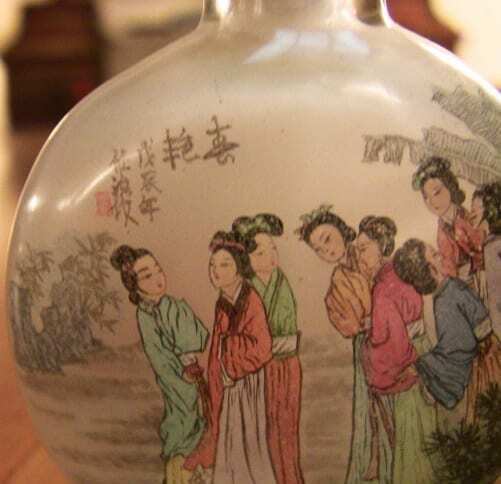 Like other types of snuff bottle, the range of subject matter used on inside painted bottles is without limit. There are scenes, fish, birds, poems, even portraits. 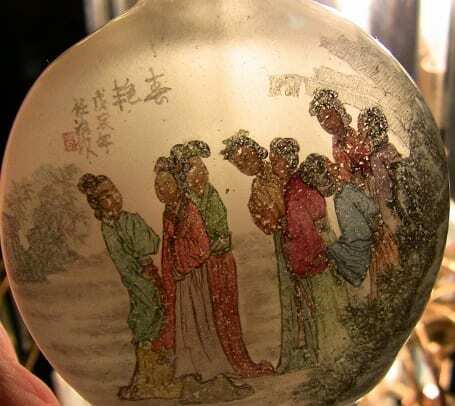 They are testament to the skill and inventiveness of Chinese craftsmen and are intended to be viewed as a miniature painting within the bottle. Chinese snuff bottles were typically decorated with paintings or carvings, which distinguished bottles of different quality and value. Decorative bottles were, and remain, time-consuming in their production and are thus desirable for today's collectors. Provenance: Bought at Auction in UK.